Q: What should I do if my monitor is defective or I have some other problem? A: Please read the manual first before you use the display. If the problem can not be solved with the help of the manual, please contact us directly. We have qualified, direct support. You can contact us via support@faytech.us or give us a call at 646.205.3214 ext. 102. If you have a defect and you are within North America, please send the product directly to Faytech North America warehouse in New York City at 149 West 27th Street New York, NY 10001. We will check, repair or exchange your defective product promptly. If you are living in another country, please contact your local sales agent or our Chinese headquarters. You can find more handling information in the manual or on www.faytech.com, under Support/RMA-process. A: Frequently, users want to use the 800x480 resolution on the 7″ displays. This is not a standard resolution. For this reason, many graphic cards do not support the resolution by default. With the program power strip from EnTech, you can learn your graphic card this special resolution. You can download the power strip timing parameter for the 800x480 resolution from our website. Yet please keep in mind that there are several graphic cards, special in the field of embedded computer technic, which are not able to support the 800x480 resolution. In this case, you should use the 800x600 resolution. A: Within the 7″to 12.1″OSD-menu, you can change the picture to mirror inverted or upside down. This function is necessary, when the monitors is mounted over head or you use a rear view camera. The settings can be made within the OSD-menu when you have a video source connected and you open the OSD-menu (display is in Video1 or Video2 mode). A: The 15″ to 22″ touch monitors have a VESA-100 holder on the backside. 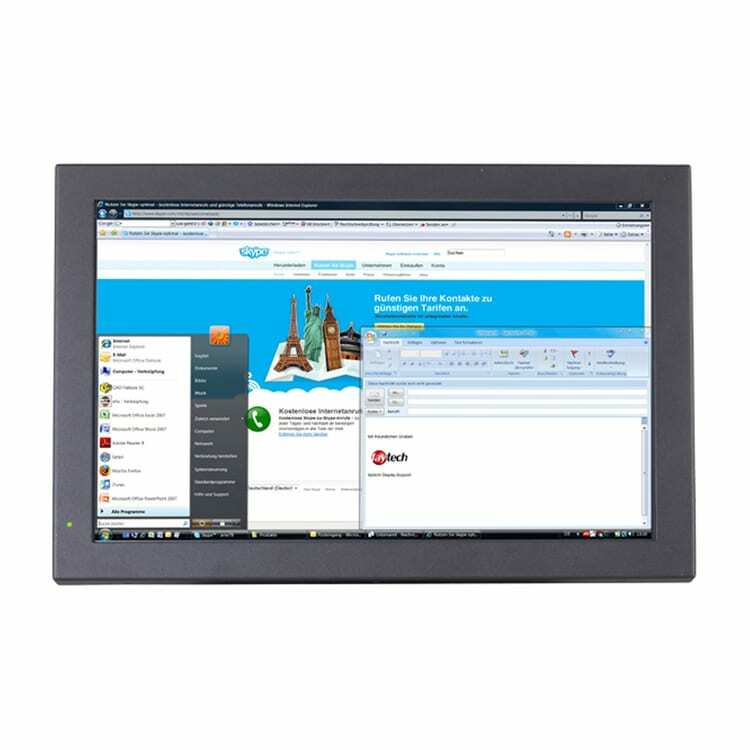 The 7″ to 12″ touch monitors can be fixed on the wall through the connection track on the backside or through the in delivery included pedestal. A: All displays have an external power supply. That means, that they are supplied by 12V DC. That is why you have two options to use the 12V DC power supply or the 230V general grid through the power supply included in delivery. A: The main usage of the touch display is together with a touch PC. That means, that you should connect the display via VGA for the picture and via USB for the touch functionality. Furthermore, all monitors have loudspeakers which you can connect through a 3.5mm stereo jack. The 7″ to 12.1” touch display series has besides the VGA-connector two video cinch inputs each. To them, you can connect your camera, DVD-player, gaming console or handy with appropriate video/tv-out. A: The touch panel is justified during the manufacturing process. Yet any time, you can make a new justification within the touch software under the “calibration” item. A: No, the touch panel is transparent and non-reflecting. So you do not notice the additional “plate”. A: Yes, that is possible. Through the software function “Multi Monitor” you can use more touch monitors at the same time. Also, you can decide, on which monitor the cursor is moved when you touch one of the touch monitors. A: The touch function is supported through the USB-connector. Just install the enclosed software (drivers for all popular operating systems are available for Windows, Linux, Mac). Please be aware that the software only works with a PC! You cannot control a DVD-player, a camera, etc. by connecting it to the touch monitor with the USB-adapter. After the successful driver installation, you control the cursor of the PC with your finger or a pen. One touch is the left mouse button, two times fast is a double click and if you press and hold longer it is the klick of the right mouse button. Additional, you can optimize the software settings for your own personal usage. With the help of e.g. the Microsoft virtual keyboard (included in the Microsoft operating system) you can steer your PC completely without any additional device. Any other questions for Faytech North America? Please feel free to reach us at support@faytech.us or give us a call at 646.205.3214 ext. 102.